The New Bright RC Sport series is a full lineup of quintessential full-function (forward/reverse, left/right) RC cars sold at the lowest reasonable price. 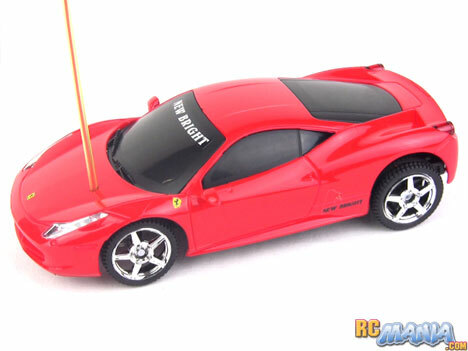 Several different sizes are offered, and here I got my hands on a little 1/24th scale Ferrari 458 Italia. The package says these cars are for kids as young as 4, so that immediately lowers my expectations when it comes to performance and features. The car itself looks great in spite of its low price, and it has good detailing and nice chrome accents. The only thing I really don't like is the antenna on the car, which has a really thick tube that comes out in an awkward place. Looks are important, but so is performance, and the New Bright RC Sport 1/24th scale really delivered. It's not a crazy fast car. It's instead just the right speed for the age of kids it's designed for. It has a little more power than it needs to get around, so you can successfully drive it around on a slight incline without it running out of "gas" and slowing to a stop. Steering responds quickly and the car really feels alive. It's fun to operate and fun to watch in motion. New Bright got the 1/24th scale RC Sport series right. These cars, available with a variety of different body styles other than this Ferrari 458 Italia, are quick, fun, and inexpensive. I think the video speaks for itself!